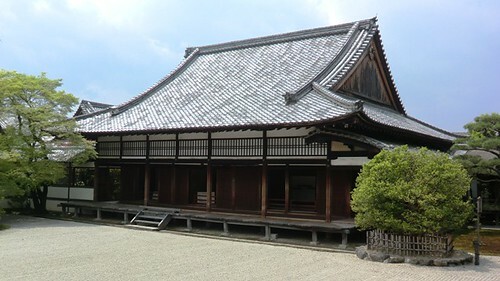 Recently a survey of the buildings at Ninna-ji has been completed and 7 structures within Goten and 1 outside of Goten are slated to be added to the Japanese Government’s list of Registered Tangible Cultural Properties in the coming months. Buildings to be registered include: the entrance hall, Shinden, Shiro-shoin, Kuro-shoin, Reimeiden, Chokushi Gate, Kōzoku (Imperial Family) Gate, and Reihō-kan. This pending registration does not involve any changes for visitors to the temple, however. Structures registered as Tangible Cultural Properties are eligible to receive some government assistance for maintenance and repairs. When the pending registration is complete it will be that much easier for the temple to keep its properties in peak condition for visitors for years to come. Shiro-shoin was the first building completed during the reconstruction after the palace area was destroyed in a fire in the late 1800s. It was used as the abbot’s temporary living quarters until Shinden was completed. 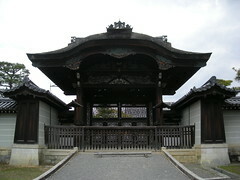 After the completion of Shinden, Shiro-shoin came be used as the abbot’s informal reception room. 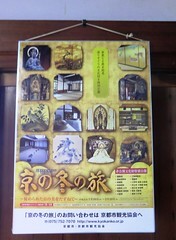 There is another building in the palace complex called “Kuro-shoin” that was used as the formal reception room. These two buildings are not particular to Ninna-ji, both are types of buildings commonly found in imperial compounds. The “shiro” (“white” in Japanese) in Shiro-shoin once referred to the emphasis on unpainted woodwork in the interior of the rooms while the “kuro” (“black”) in Kuro-shoin referred to the use of black lacquer in the rooms. You’ll notice at Ninna-ji there is actually little difference in the woodwork of the two rooms now, but at one time during the history of imperial architecture this was the difference that set the two buildings apart and resulted in their names. At Ninna-ji, Shiro-shoin is the informal reception room while Kuro-shoin is the formal reception room, but the formality levels may be switched at other temples. 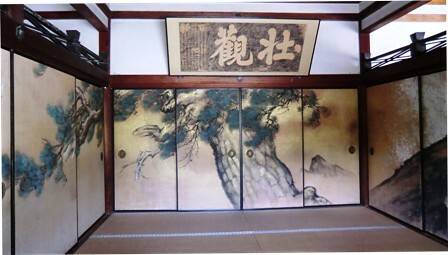 The paintings decorating the sliding door panels in Shiro-shoin are by Seihan Fukunaga and were completed in 1937.